The Association of Chartered Certified Accountants (ACCA) is the global body for professional accountants. With over 100 years of providing world-class accounting and finance qualifications, the ACCA has significantly raised its international profile in recent years and now supports a BSc (Hons) in Applied Accounting and an MBA.BPP Learning Media is an ACCA Official Publisher. 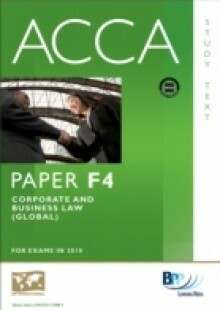 The ACCA F4 Global syllabus seeks to develop knowledge and skill in the understanding of the general legal framework that is relevant to the international business context in which accountants work, of specific legal areas relating to business, and of recognition of the need to seek further legal advice when necessary.The syllabus also covers how businesses are affected by the law, including: * The types of business that can be established * How companies are formed, administered, financed and closed down * How businesses trade * The impact of ethics and corporate governance.This examiner-reviewed F4 Global text takes the reader on a journey from complete novice to an accountant who has a good understanding of the legal issues relevant to businesses in an international context. It comprehensively covers all the detail required to pass the ACCA's law exam and the examiner has commented that &quote;...this is an extremely impressive text...&quote;BPP Learning Media is the publisher of choice for many ACCA students and tuition providers worldwide. Join them and plug into a world of expertise in ACCA exams.